As occasions go commemorating the Armistice Centenary on Remembrance Sunday doesn’t get much bigger or more poignant. 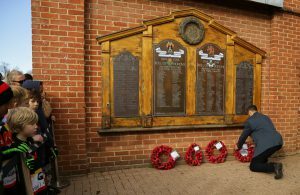 First thing in the morning saw members of the squad conduct an act of remembrance in Richmond before arriving at Richmond Athletic Ground to start the preparations for what was going to be a full day of activity. First there was the not so small matter of a pre-match lunch and panel discussion with some of the star players from both teams. Mike Tindall, Thinus Delport and Serge Betsen amongst others shared their thoughts on the game with a very attentive audience and gave some insight into what remembrance meant to them and why they were so keen to be involved with the match. As the lunch progressed both teams assembled and got ready for kick off. 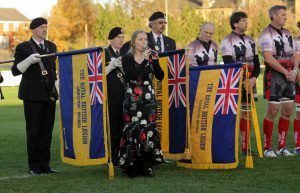 Shortly before 3pm the teams formed up on the pitch and with members of The Royal British Legion, local Cadets, representatives from the London Scottish FC and Richmond FC Minis and a piper from the Queens Own Gurkha Logistics Regiment were treated to some outstanding singing from Millie Underwood prior to observing a 2 minutes’ silence. As the time approached for kick off both teams prepared themselves for the 80 minutes to come. As some of the players in each team were at the more senior end of their playing days there was an agreement for rolling substitutions during the game – for some this would prove to be a lifeline! Following a well taken kick off the Rugby for Heroes team put together some well worked periods of play to quickly open the scoring for the day with Jonny Goodridge touching down for the opening try. Rugby for Heroes started to exert some early dominance with Mike Tindall and Keith Senior controlling the play. Another couple of tries followed before the French Legends with some determined play led by Serge Betsen crossed the Rugby for Heroes line. The pace of the game was frenetic with both sides seeking to assert their dominance over the other. Some excellent tactical play by the French Legends combined with clever substitutions coordinated by their coach Abdelatif Benazzi saw their hard work and effort rewarded. 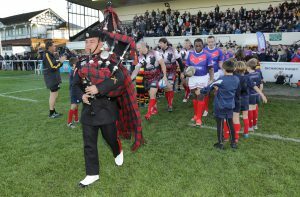 The scores narrowed to such an extent that at the half time whistle it was 26 – 17 to Rugby for Heroes. After a much needed half time break the teams took to the pitch. The Legends started the second half more brightly and quickly scored. The Rugby for Heroes team very quickly hit back, following some excellent work in the line out by ex US Eagles player Todd Clever. The team drove the ball up the pitch and after some great work in the tight the ball found its way out towards the wing and into the hands of Jonny Goodridge to touch down for his hat trick. The Legends then made some more substitutions bringing on Lee Ratcliff and Dave “Disco” Clutterbuck for the last 15 minutes of the game. Both sides competed right up to the final whistle but the strength and power of the Rugby for Heroes XV showed through with them eventually edging the result 45-41. The Man of the Match award was a close-run decision, but following some lengthy deliberations it was awarded to Rugby for Heroes’ player and former Exeter Chief, Matt Jess. Thanks for making the day possible must go to both teams, Richmond Athletic Association and the charity supporters who put in significant time and effort. The referee Nick Wood and his touch judges did a great job and ensured there was a safe and enjoyable game to watch. A final word must go to our charity partner The Royal British Legion and our sponsors, Ricoh and Rotary Watches. Everyone combined on the day for an exceptional event and one fitting of such an important commemoration.